Whether you are building an online business from scratch, doing Search Engine Marketing for a client, researching keywords for your local business or are into niche marketing…it all starts with keyword research. Having the right tool for the job is going to make your life so much easier and profitable. I remember when I first started doing keyword research back in 1999, I was using WordTracker to find the keyword phrases and ever since then I’ve been hooked. Doing keyword research to find out what people are searching for, then fulfilling that need is the greatest thing you can be doing. When you first start out looking for keywords you naturally use the keywords that YOU would normally use and chances are many others are doing the same. But what if I told you this little gem named Jaaxy will help you find assiciated keyword phrases you had never even thought of and let you know how competitive they are? Don’t believe me? Let’s give her a spin and see what’s inside the minds of all those billions of web searchers. I remember years ago, we landed a SEO contract for a local shoe store and while doing keyword research I kept seeing this trend that baffled me. People were looking for woman size 5 shoes more than any other sizes. When I brought this to the attention of the owner she said that a size 5 woman’s shoe was uncommon and that they have very little stock for that size. So, out of curiosity to see if this trend is still the same 13 yrs. later and we could turn it into a niche website, we are going to use it for our demonstration. I used a broad keyword phrase “size 5 shoe” so I could get a better idea as to what terms people are using. Oh my Gosh! I think I just found you a gold mine if you’re a shoe fashionista! 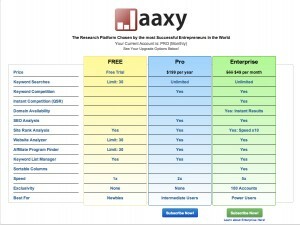 I think right now would be a great time to explain the powerful features Jaaxy offers since you can “see” the results it just brought back to us. When you plug in a very broad search term such as “size 5 shoes” Jaaxy supplies you with a list of related keywords along with suggested keyword phrases that are similar to what you searched on. So it looks like women with a size 5 or 12 foot have a hard time finding shoes huh? Why don’t you go ahead and give it a try right now with a keyword you think might make a good niche. Armed with keyword phrases we hadn’t even thought of like “size 12 women shoes” and “women shoes size 5” let’s look at how many people are searching for these keyword phrases. Whoa!!! That is a ton of people searching on those two completely different keyword phrases. This is getting me a little bit excited so lets move onto the next column and see what our competition looks like. Quoted Search Results are the # of competing web pages (not websites) that are trying to rank for that Exact keyword in Google. Ideally you would like this number to be less than 400 so that you have a better chance with new content getting listed on the 1st page in Google. 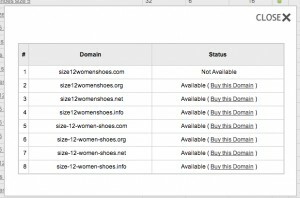 So you can see from our search “size 5 shoe” that for the keyword phrase “women shoes size 5” only has 111 page trying to rank for that search term. Do you see the QSR for “size 12 women shoes”? There is only 142 web pages out of billions of pages online that are targeting that specific keyword phrase. That is way under the 400 that you should be aiming for. 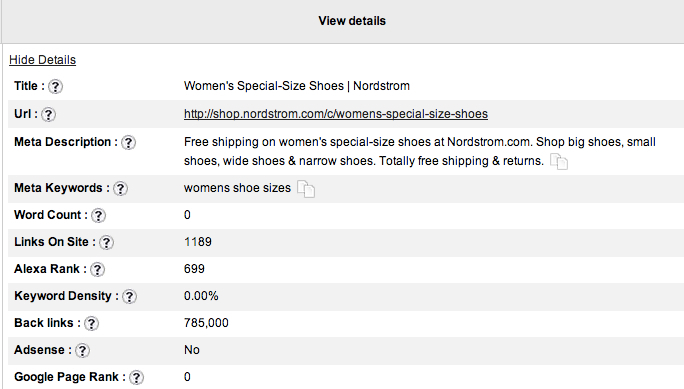 Look at the “women shoes size 5” QSR, it only has 111 at this time. This is where Jaaxy takes it a step further for the Niche Marketer in all of us. So we have found TWO highly searched on and very profitable keyword phrases but let’s check and see if we can’t purchase the domain names. 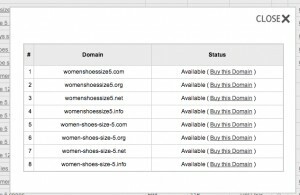 You can quickly see that the domain size12womensshoes.com is already taken BUT the womensshoesize5.com is not. So at this point I can simply click on the Buy This Domain and have a highly searched, profitable, keyword related domain name in just seconds. This feature in Jaaxy is great to find where you are ranking in the Search Engines. Simply enter a keyword phrase along with the website you want to see the rankings on and Jaaxy will do the work for you. With this feature Jaaxy spies on the top 10 ranking sites for your keyword and supplies you with the following information for each competitor. The only con I have found with Jaaxy is the fact that you can’t just type in your domain name and see all the other keyword phrases you are ranking for. 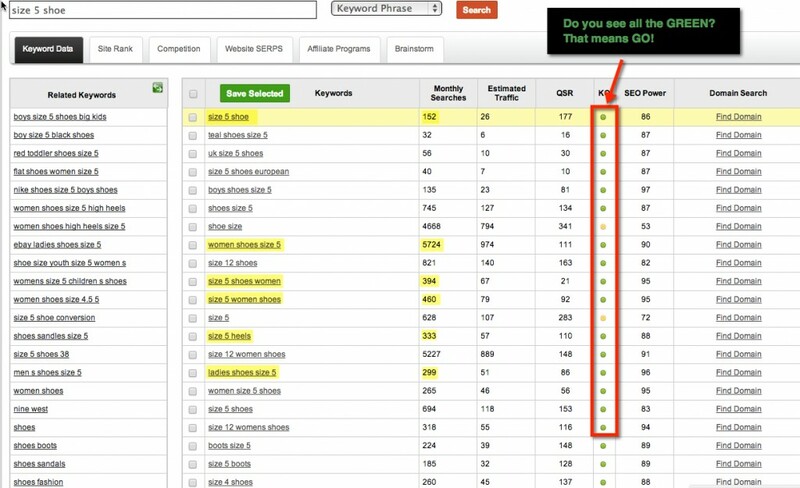 You have to type in a specific keyword phrase in order to see your sites ranking and just as we have seen in the example above, there are so many different keyword phrases that you never even consider. How much is Jaaxy going to cost me? Starter Membership (Great for Newbies): $0 (Try it Today) ~ Access to Keyword Searches (limit 30), site ranking, website analyzer (limit 30) (limit 30), affiliate finder and keyword list manager. If you are serious about ranking your site in the Search Engines and are looking for a powerful keyword research tool then I would definitely say Jaaxy is a win/win. You are able to find those low hanging keyword phrases that are easy to rank for and that have low competition in less than 30 seconds. Hey Rick, Thanks for stopping by and commenting. You are so right about being better than the Adwords tool. I love the fact that I can get instant results as to whether or not a keyword is going to be easy or tough to rank for. I have not yet taken the jump to Enterprise yet so the $19/month isn’t to bad for all the features we get. Are you on Enterprise by any chance?